Mulgrew asks for moment of silence for former Francis Lewis High School Chapter Leader Mark Shaffer. Calls DA governing body of UFT. Praises commercial that’s running. Says it shows what we do well. Runs it. Says many people are upset about it and brings up people from commercial, all teachers. Says we are part of statewide coalition fighting Constitutional Convention. Says Conservative Party head is his new ally. Tough to keep up with craziness. Heading toward budget sessions. At state and city levels there’s no sense of what Feds are about. Cuts in insurance, for example, influence governors. Feds want to get rid of CHIP, children’s health program. States may replace funds but it will come out of state budget. NY State already looking at 4 billion dollar hole. Could affect city. Feds can make it worse. If state has to fill double this hole, we won’t do well with the city. Mayor and Governor unable to do budget with this uncertainly. Education cut to the bone in other states. Working conditions awful for teachers in states without sufficient budgets. Having all this instability at national level will affect us. Thanks us for disaster relief work. We were there in Houston, FL, and PR. Now looking toward California and affected islands. Says Puerto Rican teacher building used for delivering supplies. Remembers many people helped us during Sandy, and we return favor. SUNY charter institute can certify teachers with no experience. 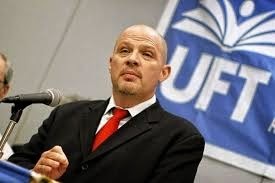 UFT is suing. Says this makes negative statement about teaching. Charters at fault for not being able to keep teachers. 40% overall, Moskowitz Academies over 50%. Says we are professionals, not people who walk off the street. We don’t need scripted lessons and teachers treated like dirt. Board of Regents considering new accountability for charters. Thinks they should be accountable for students they lose. NYC has 76% grad rate. Charters can say 100%. But there are 18 kids in class now. Were 78 when they began. Our system is at 76%. That’s all the kids. What if we didn’t have to count 20%? We’d be at 96%. Wrote editorial that charters can’t do math. We’ve been saying this for years. We don’t lose kids—they go to other schools. Charters set targets for ELL, special ed., etc. If they try, place an ad, whatever, that’s good enough. They don’t actually have to take the kids. We are at all time high. We passed 76%, you lost that much. Happy with Regents right now. Talks election. Have you reached out? Are we talking to colleagues? Do you have magnets? Says we have magnets, asks to bring them up. They are passed out. Cites 57th anniversary of first UFT strike, Nov. 7th. That’s why we need to get word out. Talks mayor’s race. Says even our enemies say school system is doing better. Says would be better if we had better local management. Says he spent time where student was murdered last month. Very young staff, very difficult. Says he’s never faced anything like that. Gives them credit for keeping school going. DOE ignored warning signs. Surveys noted bullying. Says Tweed could do better. There are ten schools with similar scenarios. DOE claims to have plan, but we don’t know what it is. No con con magnets are passed out. Mulgrew says magnet is not for the refrigerator. It’s for the car. He promises they will stick, and hopefully not take off paint. Says UFT not legally liable should that occur. Main focus is to pass info for all consultations as required by contract. Thanks those who have uploaded them. Getting to know when things aren’t being solved and bringing to superintendents. We have to build pressure that we are looking at everything. If principals aren’t nice, things now go out of building. Every consultation Mulgrew holds will be brought to superintendents. Asks that class sizes are brought up until they are solved. Says superintendents have instructed that they be solved. Says class size grievances aren’t being resolved. The need to know people are watching. Good results with paperwork complaints. They go directly to district and then central. Already we hear about five page unit plans, curriculum maps, and we have the power to stop it. Principals cannot order teachers to do same thing all the time, must be an exception. If you don’t agree with programs or changes, you can file for conciliation online. Most payments went out last week. They paid money at first arbitration but didn’t fix system. Based on frustration we won another. Seems to work much better, are hoping to fix last few things. If teachers have issues, there is SESIS inquiry on website. Lump sum payments out this week. There are different payroll banks, but everyone should get it by next week. Subject to tax, social security and union dues. MOSLs picked for next year. Hope you picked multiple measures. First year we got to use matrix. We used to get 300 U ratings, got 214 I ratings this year. Says some people want to go back to old way. Says principals and superintendents say we are usurping from them. Thanks people for emails urging us to end early for Yankee game. Speaks of what teachers did this weekend. Raised over a million dollars for Strides. Thanks Serbia Silva. Asks that organizers come inside. DA applauds. CTLE—We are working and have asked DOE to partner with us. They want to do it themselves, and don’t do it correctly. Principals incorrect if they say PD is CTLE. Must be certified. Needs record of attendance and certificate. Asking since last September. Can’t get it done. Hoping that what happened this weekend will help because they now say they will work with us. We have PD in the contract. We should be using that time. We have schools that have worked with us and their PD does count. Absurd that union has to build data system to track this. We keep records of everything. Saturday, second annual ELL conference. Closed registration because 740 people registered. 1200 people showed up. Handled well by Evelyn de Jesus and her team. Chancellor, Board of Regents were here, praised how it was done. May cause breakthrough. Pushing to do this. Some superintendents asking UFT for help. Teacher union day November 5th. City calls us 1% for not paying premiums on health care. Mulgrew says we paid not to pay. We did 1.4 million prescriptions with Welfare Fund. Praises Artie Pepper for steering us, says we’ve never denied anyone a pill no matter how much it cost. Will award Artie Pepper at union day. UFT Welcome Center open downstairs. Water, coffee, reduced price movie tickets available. Janus—Will be ugly, brutal, and we will be “Right to Work” country. Small number of folks financed this. They have a plan. Built ALEC, came up with cases that go to Supreme Court and are changing laws how they wish. Janus not even top 5 of really horrible things. Want to pass a law to weaken unions, under guise of freedom of speech. They will say not paying union dues will be a raise, but longterm will hurt people for lack of union. We are largest local in country, will be targeted. We have to educate people. Welfare fund alone worth more than dues. If unions weakened, they will take your rights and benefits. People getting there is something wrong with this case but people not sure members will pay. After constitutional convention we want to visit members at home and talk about this. Some visits will be tough. Some won’t. Because of what we’ve committed our lives to, we have to try to do this. We will need people trained in how to do this work. We know where everyone lives. We are planning. This weekend we will train people and roll this out a little bit. We have to try this. I believe best way is face to face. Everyone thinks you can just send out emails and texts, but there is too much at risk. I ask people in this room because you are the leaders of this union. We did this upstate earlier this year. NYC is a little different. We want to give two days of training. Then there will be knocking in geographic areas. We need only a few for this weekend. We will do social media, but in the end, this union was built on people talking face to face. We have to return to that, keep it simple and have honest conversation. At NYSUT they knocked on 35K doors, spoke with 9K people, used 50 people. We believe we can knock on 110-120K doors. We will engage them and hear from them. We will update database. This is the most difficult we’ve had, probably since the formation of the union. We need you to step up. First training this weekend. Once you’re trained, we need three sessions per week for 18 sessions. Raise your hand if you might want to do this. Barr happy with number of hands, asks people to sign up today. It’s not just for this weekend—there will be three sessions. Thanks people before they sign up. Reminds us of phone banks. When you cast ballot, turn it over and check no on proposition 1. Anniversary of 1960 strike. Same day people want to take rights we won away. Phone banks in every borough. Asks for people to commit. Thanksgiving winter clothing drive. Also for next DA. CL weekend October 28-29. CL job evolving. CL with 5 years or more can come again. Next DA Nov. 8. Negotiating session passed—moving in right direction but they haven’t seen it yet. Hopefully they will see the light. 5600 new members hired this year. Mid October will be meetings. Q—Admin strongly suggesting teachers upload lesson plans on Google Docs? What to we do? M—File paperwork complaint. Is routinized collection. Principal playing game. Tech is better now, and many schools embrace it. This is crossing a line. Unless school does SBO you can’t let that happen. Q—With governor looking to be president, we should march on Albany and say it’s a disgrace what he’s doing to quality of ed. in NYS. If we allow charters to do training, how will that affect colleges? M—A lot. SUNY charter institute did this, not the governor. I agree he should step in. People unhappy we filed lawsuit next day. I said I would do this. I did what I said I would. Governor trying to establish he’s voice of Democratic Party standing for working people. He’s been speaking against feds. Wants to take back GOP seats from Congress. GOP screwed NY State with horrendous deal. We will go after them. We’re looking for common ground. Class size—many unions would not sacrifice raises for class size numbers. With recession, many districts saw class sizes explode. Thank God people did that or think of what Bloomberg would’ve done. Q—Been said our pension fund would be used for affordable housing. True? How are we protected? M—True. We make investments, our trustees vote, and we get return required so pension is safe. We invest in many things. Thankful that we have independent trustees who vote on our needs. M—We monitor it, always. We are in good shape. Q—We know responsibilities as mandated reporters. What if colleagues harassed. M—Not mandated, but you have OEO. Q—Our school has to write teacher goals each year. Some teachers chose to abstain. Teachers who wrote goals have been directed to revise. Can teachers be held accountable? Can I see answer in writing? M—No to all. Did you bring it up in consultation? Did you post notes (yes)? Asks Debbie Poulos to flag this. Q—Other city agencies get Veteran’s Day. Why don’t we? M—Policy is if it falls on Saturday, they don’t give it on Friday. Not our idea. We only have two snow days this year. Evelyn de Jesus—Fight Trump admin in eliminating DACA. Must fight threat of deportation. Dreamers in classrooms, schools, hospitals. For five years they lived out of shadows. Could drive and pay in state tuition. Feds have their personal info and that of their families. Repeal is betrayal of trust. Asks for support. Michael Freeman, CL—School has so many immigrants, they come to my school. I know they will be wonderful citizens. Students are happy to be better treated here. This is future of America. We’re betraying these people, I stand in support. Dave Pecoraro—proposes amendment—UFT opposes the efforts of assembly member Nichole Maliotakis to reveal info on DACA members. Could reveal NYCID info. Karen Allford—Supports resolution to aid hurricane and wildfire victims. Praises nurses. Janella Hinds—Motivates resolution to support NYC march for climate justice. We need to speak out against Trump’s terrible policies.